The Mactaquac Dam spillway, New Brunswick, on a foggy morning. Due to the growing interest in sustainable energy futures, jurisdictions at all scales are exploring options to reduce dependencies on dwindling fossil fuel reserves and moving forward with renewable energy generation. In the pursuit of a sustainable energy future we have to understand not only the economic and environmental implications that renewable energy infrastructure will have but also the social implications of such a change. The purpose of this study was to understand how people can come to accept utilitarian energy infrastructure in the landscape. This study used a hydroelectric dam and headpond to understand public perception and landscape values. Dam removal and rebuilding decisions are going to increase as dams continue to age and the Mactaquac Dam offers us a case study to understand the emotions and values that citizens have felt throughout the life of a dam. Wendy, Simon and Joy stuffing envelopes with surveys in the Hayes Room. Thanks to Wendy and Joy for pitching in to fold 1850 12-page Marginal Land Management surveys this week, number them so we can keep track of responses, and stuff them into envelopes. A crucial task, but not an entertaining one, although they made it look fun. 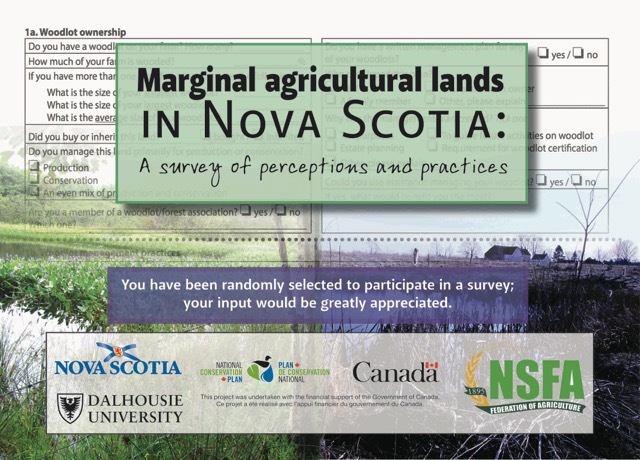 The postcard notice has gone out to the thousand Nova Scotia farmers selected for the study, and we’ll send out this first round of surveys next week. I never thought I’d say this, after the wet summer we’ve had, but I hope it stays wet so the farmers have little better to do than respond! Thanks, Carlisle, for this picture of Yan in action at Social Media and Society in Toronto. These ‘work in progress’ sessions are a great opportunity for those who are in the middle of research to get feedback. The image on the screen is Yan’s next challenge in understanding her Instagram data, collected in the footprint of the Mactaquac (NB) and Site C (BC) hydroelectric projects: can they be used to identify hotspots of cultural value? Geographic coordinates selected by Yan Chen for her study of Instagram photos around two hydroelectric proposals, Mactaquac (left) and Site C (right); Netlytic will download all images posted within a 5 km radius of each point. This week, Yan Chen, an MES candidate with our Energy project is presenting her work at the Social Media and Society Conference in Toronto. She is using Instagram to understand how young citizens feel about areas affected by hydroelectric proposals. In general, young people can be difficult to engage in conventional means by proponents or researchers of landscape change. Over the past year, Yan has collected geotagged Instagram photographs from the geographic areas around the Mactaquac Dam headpond on the Saint John River, in NB, and the Site C dam on the Peace River, BC. These are interesting parallel cases. The first is a dam that may have to be removed, the second a dam that has been approved for construction; both the third on their river reaches, of a similar size, inundated area, etc. She is coding the images to understand the lifestyle of young people in each region (leveraging the bias in this social media site towards the under-35), and how they might be affected by potential landscape scenarios. Being a social media conference, the online abstracts allow individuals attending the conference to tag the presentations they plan to attend. Already, seven people have expressed interest in Yan’s ‘work in progress’ talk on this work tomorrow, including our own Carlisle Kent, summer intern on the HM project who is based at the Social Media Lab at Ryerson organizing the event, and that is behind the Netlytic software Yan is using in her work. As I write this, Simon Greenland-Smith, extension officer and project manager for our Species at Risk Partnerships on Private Land project, is sitting in the SRES conference room applying address stickers to 1000 pre-survey postcards for our study about farm management on marginal land. This survey is a joint undertaking, funded by Environment Canada (EC) under the program above, but also the Nova Scotia Department of Natural Resources (DNR), and in close collaboration with the Nova Scotia Federation of Agriculture. Knowing how over-surveyed Nova Scotia farmers have been in recent years (and I have been part of that problem, with DNR-sponsored surveys on farm biodiversity and nuisance nature), we are joining together to merge four surveys into one. For this one survey, however, we are going to work hard to get a good response rate. Single mail-out surveys typically only get a 10-20% response rate, which weakens the analysis and conclusions that can be drawn: it is unclear if those who responded are representative of the population of interest. We will use multiple reminders, including this pre-survey postcard to let people know what is coming and why. We hope for a good response rate, sooner than later, because the postage costs for each mailout are non-trivial. Thanks in advance to the kind farmers who help us meet our targets.